Vacuuming and recharging air conditioning systems are common services performed in garages, shops, and automotive businesses everywhere. When it comes to damage-causing moisture, a powerful air conditioner vacuum pump may very well be your best line of defense. Best Buy Auto Equipment offers a vast selection of A/C vacuum pumps from some of the most trusted brands in the industry, such as ATD Tools, Mastercool, Mountain, Robinair, and more. 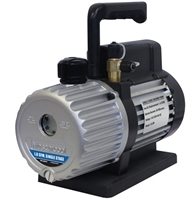 In addition to offering a wide range of models at competitive prices, many of the vacuum pumps we supply are eligible for free shipping while supplies last. Don't forget to register your account and sign up for our newsletter today! From fast, efficient air vacuum pumps to two-stage vacuum pumps with gas ballast features to prevent oil contamination, we have all your needs covered in our Robinair vacuum pump collection. 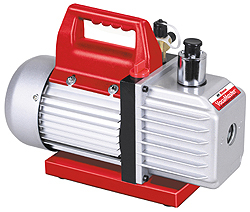 Many of the VacuMaster pumps we offer feature a two-stage design to clean the system more thoroughly as well as an easily accessible oil fill port and drain plug to allow for fast oil changes. 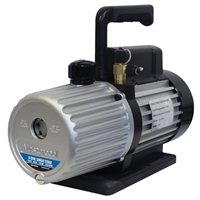 We also carry A/C vacuum pumps from the complete line of Mastercool, which are durable and time-tested. Find everything you need to jumpstart your mobile A/C services by investing in an A/C starter kit, which comes equipped with everything from the refrigerant to professional UV dye light supplies. A quality A/C vacuum pump is an integral tool for complete air conditioning service. Set your business up for success by shopping from our selection of CPS Products, FloDynamics, Lisle, and Mityvac A/C vacuum pumps today. 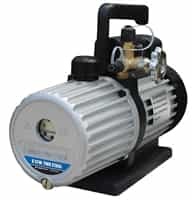 If you are shopping on a tight budget, we offer an array of budget-friendly vacuum pumps that can produce vacuum or pressure at the flip of a switch for superior accuracy and control. If you have any questions about our A/C collection, one of our product experts will happily help you find the best solution for you and your business. Please call (855) 275-5141 or email info@bestbuyautoequipment.com for more information and further assistance.